Whether you are a biker, a hiker, a culture lover or a family, the Lenzerheide holiday region invites active guests and connoisseurs to spend carefree holidays with perfect recovery. The sun-kissed high valley surprises with a multifaceted offers. Immerse yourself in the unspoiled nature of the Grisons mountains. During summer, families, friends or couples discover the mountain peaks, the fragrant alpine meadows and the crystal-clear lake Heidsee. 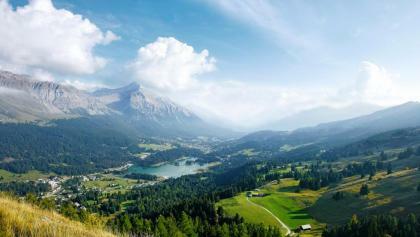 The Lenzerheide holiday region offers varied bike routes, trails and hiking paths. Cozy and spacious cabins, many fireplaces or the numerous restaurants in the village invite you to linger. In the varied Lenzerheide bike region, you can enjoy bike experiences for every style: from easy to extreme, from cozy to sporty, from the family tour to the 100 km marathon route. 300 km of signposted bike tours and over 850 km GPS tours bring the bikers to the most beautiful and isolated corners of the holiday region Lenzerheide. For more than 10 years, the Lenzerheide holiday region has been certified with the seal of approval "Families Welcome". The family-friendly offers are numerous and varied: the only Globi hiking trail in Switzerland, the Globi House or the lido at the lake Heidsee with fireplaces, a playground and a pirate ship are just some of the attractions that make a visit to the Lenzerheide holiday region an unforgettable family experience. The mountain railways of Arosa and Lenzerheide offer exciting trips to the Weissenhorn summit, Aroser Hoernli, Parpaner Rothorn, Piz Scalottas, Heidbueel or Pradaschier. The programme includes sunrise trips with culinary highlights, traditional alpine worships, children's parties and fast-paced decents with the LenziBike. The panorama of the surrounding mountains with the sparkling mountain lakes in the center enchants you at any time.